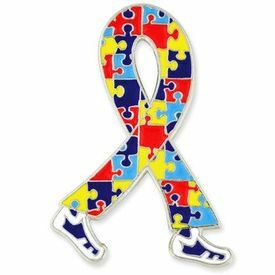 The Autism Puzzle logo became a universal sign for autism awareness in 1999. Its puzzle pattern reflects the complexity of the autism spectrum. Our Autism Awareness Ribbon Walking Pin not only represents the diversity of the people and families living with the condition but also shows your participation in raising awareness through walks and similar events. It is die struck from jeweler's metal, enamel color filled and plated in silver. This pin includes a standard clutch back and is individually poly bagged. 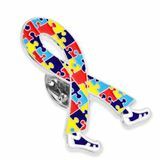 Pin size 1-1/4"H x 7/8"W. Show your support by handing them out at your next walk or wearing them.